How to Consolidate A Credit Card Debt with Bad Credit? At first, you wanted a credit, but it later turned into an overwhelming debt. It is inevitable and it can happen to anybody. Knowingly or unknowingly! As a result, you lie into your bed awake every night, because of the credit card debt. Everybody take out debts. You’re not alone. There are ways out. They worked for others and as a result, they will work for you. Don’t worry. With this article, you’ll gain control over your finances, you’ll erase your debt, and you’ll find it easy to sleep again. 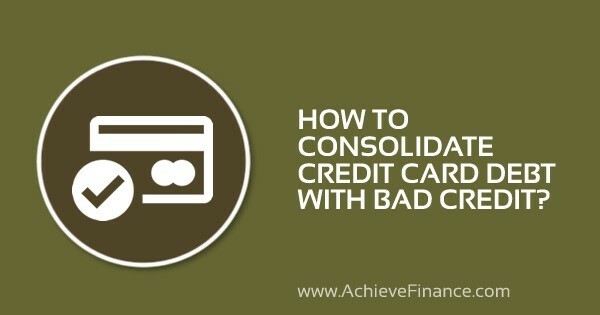 Let’s begin on how to consolidate a credit card debt with bad credit. How To Pay Off A Debt Fast With A Low Income? To pay off a credit card debt you’ve to consolidate the debt. And by taking out a personal loan online, you can do that. A single payment attracts a lower interest rate compared to that of the credit card debts. Is It A Good Idea To Consolidate A Debt With A Personal Loan? Taking out a personal loan may not be the best consolidating option for you because there are other options that need to be checked. Let’s us discuss those option with their pros and cons, so that you won’t find it complicated when making a decision on what method to use. At first, let’s get a list of the other options of credit card debts’ consolidation. What are the other ways to consolidate a credit card debt apart from a personal loan? Using a balance transfer credit consolidation. Taking out a 401(k) loan to pay off a credit card debt. A home equity loan or a line of credit can also be used to consolidate a cc loan. Is there a way to consolidate a credit card debt without hurting your credit? There are many options to consolidate a credit card debt, but there is no best way to consolidate the latter. Some can just be the best option for your specific condition or be less risky than the other options. Ensure you understand the potential risks of an option before taking it. Before we discuss each option, much must be discussed on your debt-to-income ratio, credit reports and scores. They are crucial because using the wrong option to consolidate a debt can hurt your credit. To obtain your debt-to-income ratio, sum up your monthly loan payments and divide the sum by your gross monthly income. If it looks good, you’ll find it easy to get a loan. Check your credit reports. Evaluate their accuracies. Ensure there is no error because an error on any of your credit reports can be disastrous. It can cost you a disqualification for the debt consolidation help you need. Ensure you dispute any error you find on any of credit reports. Where can you get your credit reports from? With a free credit report summary from any of the listed agencies, you’ll understand where your credit stands and that will help you choose the best consolidation plan for your situation. What’s next? … Considering each credit consolidating option. A personal loan is better than a credit card debt. Turning your credit card debt to a personal loan is a good option. A personal loan interest rate is better. It charges small interest rates compared to that of credit cards which the latter varies from time to time. Credit cards are revolving credits designed for short-term repayments whereas a personal loan can be paid back on the long term. Consolidating your credit card debt into a personal loan is a nice decision as the latter has a constant interest rate with no variation. With a personal loan, you’ll find it easy to sleep at night. Just take a personal loan online, without leaving the comfort of your home and pay off your credit card loan once and for all. Online lenders have credit requirements. Meet the requirements. Ensure you have an excellent credit score. With that, you will be qualified for a personal loan with a fast approval. Before applying for a debt consolidation online, verify the lender. Check out your potential lender with the Better Business Bureau. Also contact the Attorney General’s office, the Department of Banking, or the Financial Regulation to know if the online lender is a registered business of your country. Be cautious. Be alert to risk. Never trust an online loaner that pledges to grant a loan regardless of your credit. Stay away from an online lending platform that demands a huge upfront before granting a debt consolidation loan as well. This is another working method which is paying off your cc debt with a balance transfer. You’ll be rewarded by a credit card company when you transfer the balances from your credit card (with a high-interest rate) to a new credit card or a credit card with a lower interest rate. The reward is an introductory 0% interest rate on the transferred balances. This can also happen sometimes with your purchases. This method is like a coin. It has its good and bad sides. With a balance transfer, you can avoid paying the huge interest attached to your old credit card. For every transfer, there is a fee. The fee is usually 3% of the balance transfer or $5. To worsen it all, some lenders restrict borrowers from using this method. You can also erase your debt by using 401(K) loan. But it’s not the best option for an employer-sponsored account. However, it may be an option, if and only if the other debt consolidation methods do not work for you. A 401(K) loan doesn’t show up on a credit report when taken out. The pitfall comes if you can’t repay. And it comes with a bulky penalty plus taxes on the unpaid balance so that at the end, you’ll have to pay a higher debt. A 401(K) loan is scheduled for 5 years. If you lose or quit your job, such loan has to be paid in 60 days. Comes with a lower interest rate. No traditional application; it’s just as easy as borrowing money from yourself. No credit check; The loan doesn’t show up on your credit history. Reduces retirement funds because taxes are not removed until you want to retire. Comes with a bulky penalty plus taxes if you can’t repay. Repay within 60 days if you lose your job; no mercy. Do you own a house? If yes, take out a home equity loan or a line of credit, and use it to pay off your credit card debt. But here is the difference between a home equity loan and its line of credit. The home equity loan comes with a fixed interest rate whereas the line of credit offers you the chance to borrow the money you need again and again, but with a variable interest rate. A HELOC comes with a draw period. And the draw period is the amount of time you can withdraw funds from a credit or take out an equity loan without repayment. But after the draw period, you’re responsible for the loan repayment. The draw period ranges from 5 to 20 years, but it is 10 years most of the times. So if you take out the line of credit ensure you pay more than your minimum payment. Doing so will reduce the principal. After the draw period, you would have avoided the dent of the overall debt. Lose your house, if you fail to pay. Long repayment terms; sometimes 10 years or more. This article is helpful. It shows you how to erase your credit card debt fast with a low income, and it tells you how to do such thing by considering many options.